Believe it or not, there was a time not long ago when surfing the Internet from your back porch required a very, very long ethernet cable. These days Wi-Fi seems to be everywhere, with inkjet printers, digital cameras, TVs, and even refrigerators connecting to home and office networks without the need for cables. But for all of the gains made in Wi-Fi technology, much confusion remains about wireless networks and the problems that can plague them. To help clear up some of the confusion, we gathered a list of common beliefs about Wi-Fi speed and set about proving or disproving them using the tools available to us here in the Macworld lab. The lower your signal strength, the lower the bandwidth you'll get over your network. To test whether signal strength dropped the farther away from the router we got, we took a new Apple Time Capsule, which uses 802.11ac wireless, and connected a MacBook Pro directly to its ethernet port to act as a server. Next, we connected an 8012.11ac-equipped 2013 MacBook Air (with Wi-Fi updates applied) to the Time Capsule's closed network and ran AccessAgility's $5 WiFiPerf. As the name implies, the utility measures wireless performance over a network. I took the whole setup out in front of my quiet suburban home and ran the test at a number of set distances, ranging from 6 feet to 200 feet in direct line of sight with the Time Capsule. At 6 feet away, the transfer rate from the client (MacBook Air) to the server (MacBook Pro connected to the Time Capsule via ethernet) was 547 megabits per second (mbps). At 26 feet away, that rate dropped by 17 percent to 456 mbps. At 54 feet, the throughput dipped under 400 mbps. Getting past 100 feet, the speed dropped precipitously to just 139 mbps--about a quarter of the throughput we saw from 6 feet away. At 150 feet we got 25 mbps and at 200 unobstructed feet, we were able to eke out just 12 mbps. To test this theory, I brought that same outdoor suburban distance test indoors to a long hallway in our seven-story office building in San Francisco's South Park neighborhood. At my home, the MacBook detected 25 networks; at the office it saw 150. At a distance of 6 feet from the Time Capsule, our average throughput was 489 mbps, 11 percent less than the suburban network speed. At 26 feet, the office speed dropped to 305 mbps, 33 percent less than the suburban test result from the same distance. At 54 feet, the indoor test was 44 percent slower than in my quiet neighborhood. And at 78 feet, the speeds in my office were down 51 percent from the speed I got in front of my house at the same distance. 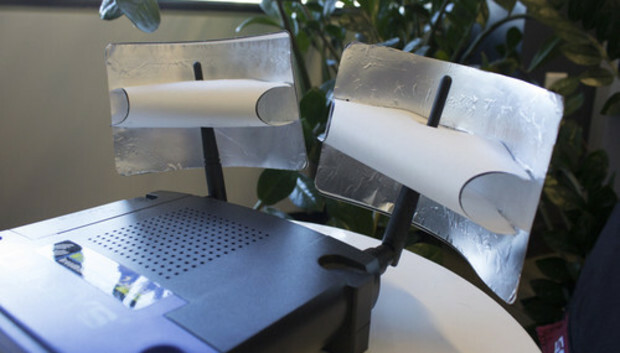 We'd seen claims on the Internet that a simple antenna enhancement could boost Wi-Fi signal strength. Was it for real? We decided to check. First, we took a Linksys EA6900 router with three external antennas and measured the throughput (using the WiFiPerf utility) at different locations around our offices. We then printed out templates for 6-inch parabolic signal reflectors from FreeAntennas.com and constructed the reflectors using paper, tape, cardboard, and tinfoil. At about 20 feet away from the router, the tests showed roughly a 12 percent throughput improvement when we used the reflectors. Moving about 70 feet away, the performance benefit increased to 43 percent. Doubling the distance reduced the throughput both with and without the reflectors, but still they helped the router deliver 46 percent higher throughput speeds overall. The antenna boosters really did offer a boost to our network's performance. This one is no myth. A microwave oven can emit a tremendous amount of energy while heating up your leftover Chinese takeout. The problem is particularly bad on the 2.4GHz frequency band--a reason to avoid using that frequency if you can. As you can see from this image captured with MetaGeek's $599 Wi-Spy DBx Pro spectrum analyzer, interference from an operating microwave stomped all over our 2.4GHz network, reducing network throughput from just over 100 mbps to about 3 mbps. We saw much less interference on the 5GHz frequency band. To change the frequency that an AirPort Extreme uses, for example, launch AirPort Utility, select your router, and click Edit. Select the Wireless tab and click Wireless Options. In the next window, check the box titled 5GHz network name. Click Save and then click Update. This will create a unique network name that you can connect to in order to ensure that you're always on the 5GHz band. Well, either you could tell your roommate to be more considerate of the rest of the household or you could switch to a router that supports Quality of Service (QoS). Apple's $179 AirPort Extreme (3.5 of 5 rating) and $299 Time Capsule (4 of 5 rating) are great routers, but this is one feature they lack. With QoS, a router can prioritize traffic traveling over the network so that applications that are sensitive to lag--online games and VoIP, for example--are given higher priority than applications that aren't, such as large file downloads. A growing trend in wireless routers is to also provide downstream QoS, which enables the router to differentiate between, say, file downloads and video streams, so that the latter gets higher priority and you can enjoy a better experience. Both the $170 Asus RT-N66U router (4.5 of 5 rating) and Netgear's $200 Nighthawk router (4.5 of 5 rating) offer this feature. You can buy expensive networking hardware and software analytics tools like MetaGeek's Wi-Spy DBx Pro spectrum analyzer. But many inexpensive (or free) tools can also shine a light onto the status of your network. Mac OS X users can simply hold down the Option key while clicking the Wi-Fi icon in the upper-right corner of the menu bar. When you do, you'll see many more details about your network: for example, the ethernet standard that your network is using (802.11 a/b/n/ac), the channel that your router is on, the type of security that's enabled, and the transmission rate and strength of your wireless signal via the RSSI (received signal strength indicator). Another great tool for understanding your network is Objective Development's $35 Little Snitch (4.5 of 5 rating). This utility will alert you when any app or process tries to access the Internet. You might be surprised by how many applications try to connect to your network. Little Snitch's status screen also shows you connected apps as well as how much data they are sending and receiving. If your network seems sluggish, Little Snitch gives you an easy way to spot bandwidth hogs. Have more Wi-Fi questions you'd like answered? Leave them for us in the comments below the article. Macworld Lab testing by Albert Filice.